The difficulty in reviewing this exquisite debut novel by Yvette Walker lies in not giving away too much. I don’t mean to suggest that Letters to the End of Love is a thriller; on the contrary, it unfolds its stories languorously, dwelling in the quotidian details and rhythms of life. It is this narrative act of unfolding—letter by letter—that gives the novel its cumulative power. Has there ever been a more perfect title, in its literal aptness and symbolic weight? Love is at the centre of each of three stories braided together through a series of letters. In one, the end of love is likely; in one, inevitable; in one, impossible, even in death. The three sets of letters are otherwise unrelated, other than for the appearance of Paul Klee’s painting Ad Marginem in each story, holding a significance for its pair of lovers, and a concomitant suggestion of the power of art itself. The Cork letters, dated 1969, tell the story of Dmitri, an exiled Russian painter, and Caithleen, his Irish writer wife. Written, at Caithleen’s request, as daily missives to each other, these letters record the ‘ordinary things, ordinary poetry’ that make up a relationship spanning four decades. The past, in all its tenderness and pain, threads around an uncertain present, as Dmitri and Caithleen reveal intimacies and hauntings that are entwined: ‘I don’t know what comes first, love or sadness, they are perfect twin pearls to me’ (Dmitri). I adore the ‘notorious dog’ who shares itself between them and bridges (or so it seems to me) the silent spaces that the letters also seek to bridge. Loneliness. Its long white feathers drop and gather around my feet, they blow out of the bar, under the hotel doors and out into the street, into the rain. I want you here and I can’t make it happen. The Bournemouth letters, 1948, are written by John, a retired English physician, to his lost love, David, a German artist, recalling the time they shared in Vienna before the onset of the Second World War. Prompted by the visit of a man carrying a message from David, these are deeply intimate, elliptical communications to which we bring our knowledge of the horror of those times, reading into their heartbreaking gaps. You told me painting was working the world out. It was diving into cold, clear mountain water. Crying in the night without dreaming. Ducking a fist in the face. It was boxes of old love letters. Leaflets strewn on the streets like yellow flowers. Suitcases stacked at train stations. These things I whispered to Peter, while the fine muslin cloth that embalms me in the world unravelled itself, like so many used bandages, into an untidy mess at my feet. 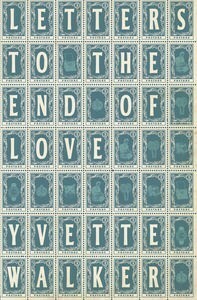 The fragmentary nature of letters, their assumptions, their confessions, their allusions, creates an ideal framework in which to tell these intimate stories of ‘love as it is, in all of its strangeness.’ I hope this review has given away no more than a taste of what Yvette Walker’s ambitious, enchanting novel has to offer. Wow! It sounds beautiful — can’t wait to read! I’ll look forward to hearing your impressions, Louise. Great review Amanda, and wasn’t it just the most beautiful book? 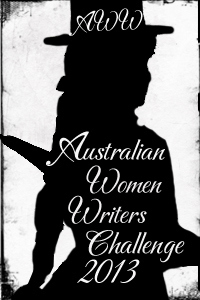 Thanks, Annabel, and yes, gorgeous! That’s the way, Glen—down with resistance! I’m glad you enjoyed it as much as I did. I simply did not want to stop reading.